I have to admit that my list has changed a bit from two weeks ago. The warlock is now level 31 but Desolace has brought me to a stop. I know I’ll play her again soon since I do love the troll and warlock is a lot of fun, but someone else has crept on the list; my tauren shaman. The panda rogue is now level 17 and running around in the Barrens without a mount is still painful as ever. She’s fun though and I do love the rogue animations for Panda’s. 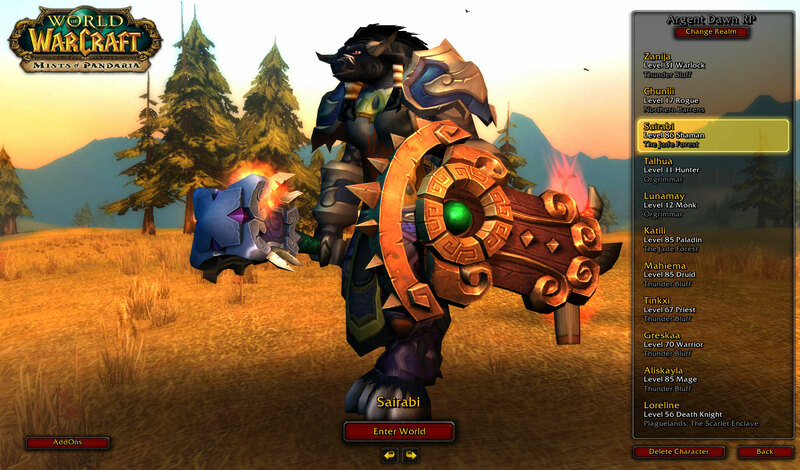 I haven’t really touched my alliance toons, except for the Pandaren hunter who’s now 87. I’d like to get her to 90, but I have a sneaky suspicion that my Tauren will reach 90 first. So I’m still pottering along, doing some pet battles now and again and trying to find that one char that will fit me like a glove again.